A spilled beer and cigarette burn in Connecticut lead to what is now one of the most exciting new acts to emerge from Brooklyn's thriving music scene. While performing with their respective bands, Rick Smith and Colin Schiller met and formed a lasting friendship and mutual creative admiration. In early 2008 the way was cleared to work together and they quickly developed a relentless motivation to bring fun, exciting dance/rock music to the masses. Crooked Looks is anything but conventional. Colin’s animalistic style on drums is reminiscent of names too great to mention. His manic, yet measured approach provides the perfect foundation for Rick Smith's beat-heavy, hook-oriented, synth pop songwriting. Colin’s energy combined with Smith’s fiery, unrestrained vocal epiphanies command audience attention and adulation. Crooked Looks song styles can vary from a frenetic dance punk gem to a funky electro piece with undeniable “singability”, paired with fierce bass, beats and synths. Crooked Looks is leaving an indelible mark as a band with a fresh take on rock and a keen inclination to write great songs without abandoning the desire to keep their audiences moving. In a short time the band has already established a dedicated, word-of-mouth fan base across Philadelphia, Baltimore, New York, and D.C. 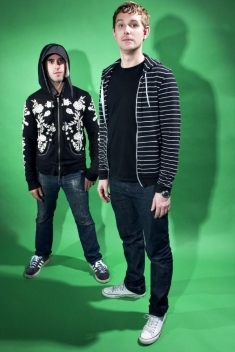 They have a Myspace following of nearly 30,000 friends and recently finished up a stint on the 2008 Vans Warped Tour. From performing at the Theater of Living Arts in Philadelphia, The Baltimore Music Conference, The Northern Liberties Music Festival and Nassau Coliseum in Long Island, to sharing the stage with acts like The Presets, Howling Bells, Pink Spiders and many others, they've developed a sound that's been heralded as honest, intense and a revealing look into the souls of two vulnerable, yet powerful entertainers.